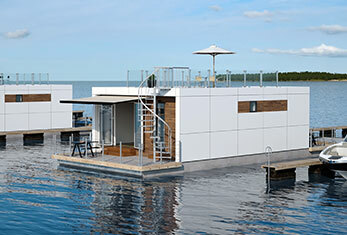 Zunshine Living designs and produces floating houses in Denmark – as permanent residence and vacation home. 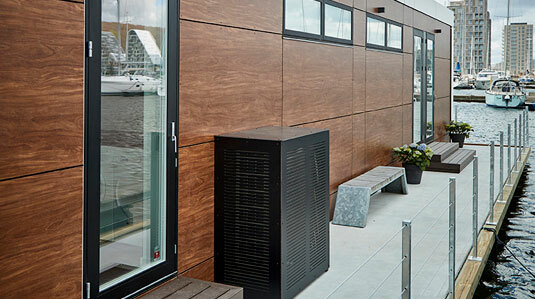 All materials are of high quality and carefully selected to ensure they can resist the climate at the sea. Attention has been paid for even the smallest detail inside and out, and the simple Nordic style is persistent throughout all the houses. Large windows in the houseboats provide lots of light and sea view, and with the large terraces you can enjoy the sun most of the day. 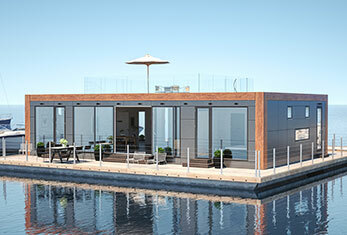 The floating homes come in several models – something for each need and taste. 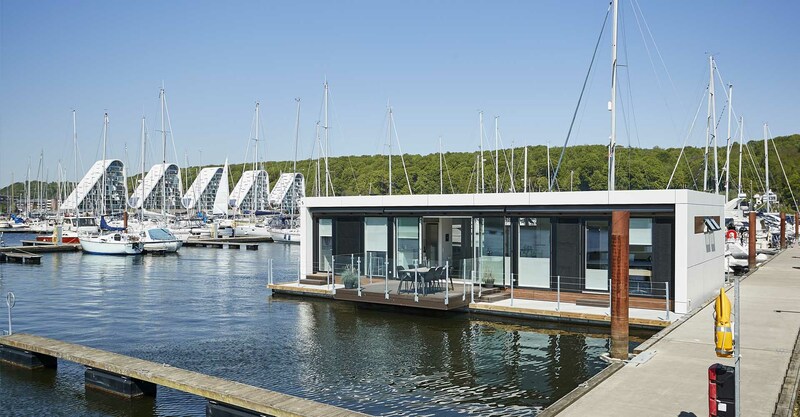 Our exhibition houseboat is of the model 114 Unique, and is placed in Holbæk harbour, Denmark. Contact us if you wish to visit the houseboat. Zunshine Living 70 is the floating cottage with many possibilities. Zunshine Living 114 is the floating permanent residence/vacation home/rental. Zunshine Living 132 is the large floating house for permanent residence. 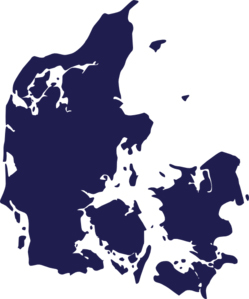 You can read a list of available houseboat berths in Denmark here. The list is regularly updated. If you have any questions about locations for houseboats in Denmark or abroad, feel free to contact us. With special isolation the layout has been increased with 10-15% depending on the model. The interior has been created with no space wasted and optimized in terms of furnishing. This means that you can easily place a table large enough for 12-20 people nomatter the model type. With 9 different model types it is quite easy to find one that can match a specific location/harbour. The floating houses are completely unsinkable. Walls, ceilings and facades are fireproof, and only allergy friendly materials are used. 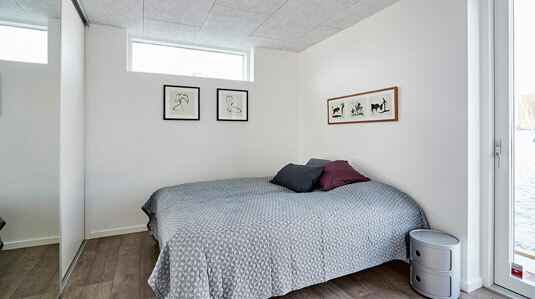 Soundproof doors and acoustic ceilings ensure a comfortable indoor environment. Modern series production ensures a constant high quality level and competitive pricing. The materials are of the best quality. 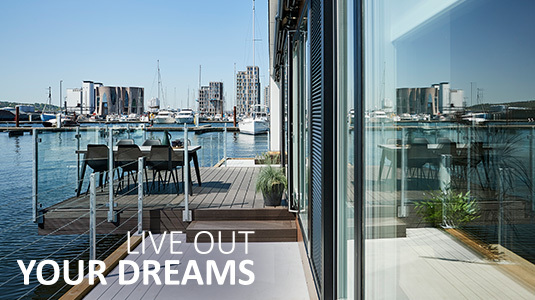 In order to ensure a long lifetime and a beautiful look of the houseboats, all outside materials are chosen in specifically weatherproof and maintenance free materials, except for cleaning. The lifetime expectation for these materials is more than 80 years. 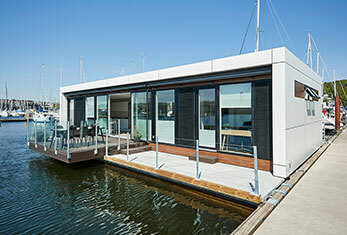 The houseboat models 114 and 132 are delivered with underfloor heating in all rooms. The temperature of each room can be controlled separately which ensures a comfortable indoor climate. The houseboat model 70 is heated and cooled with an airconditioner. Multiple climate zones ensure a precise control of the temperature of each separate room in the house. 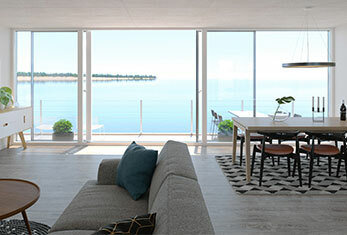 With the large windows you can enjoy the seaview from the kitchen, living room and all separate rooms in all the model types. 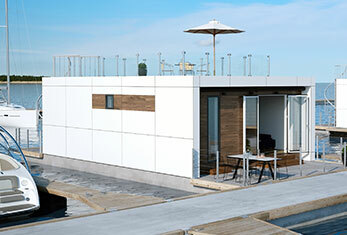 The floating houses come with two large terraces which make it possible to enjoy the sun most of the day. All models are also prepared for a roof terrace. 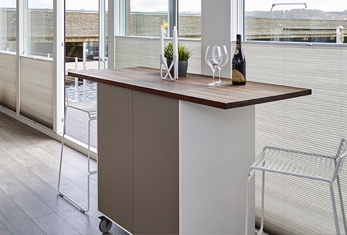 The functional console table from Svane Køkkenet has many purposes and can be used as work station, extra kitchen place and so forth. The table comes with wheels which makes it even more flexible. This practical console table is an acquisition for the 114 houseboat and can be seen in the exhibition house boat in Vejle, Denmark. All models have entrance from the pier at both ends. This means the houseboat can be positioned in an optimal way in regard to the pier, sun and view. The platform is made of high strength concrete and EPS 80 polystyrene blocks. The platform is unsinkable and doesn’t have to be checked on land every 10 years. With a weight of 73 tons, a load of 6 tons and 158 m2 of platform, the houseboat is very stable – as a house on land, and there is no fear of sea sickness.